Please view in the original resolution. One of the most accurate yet still practical representation of material appearance is the Bidirectional Texture Function (BTF). The BTF can be viewed as an extension of Bidirectional Reflectance Distribution Function (BRDF) for additional spatial information that includes local visual effects such as shadowing, inter-reflection, subsurface-scattering, etc. 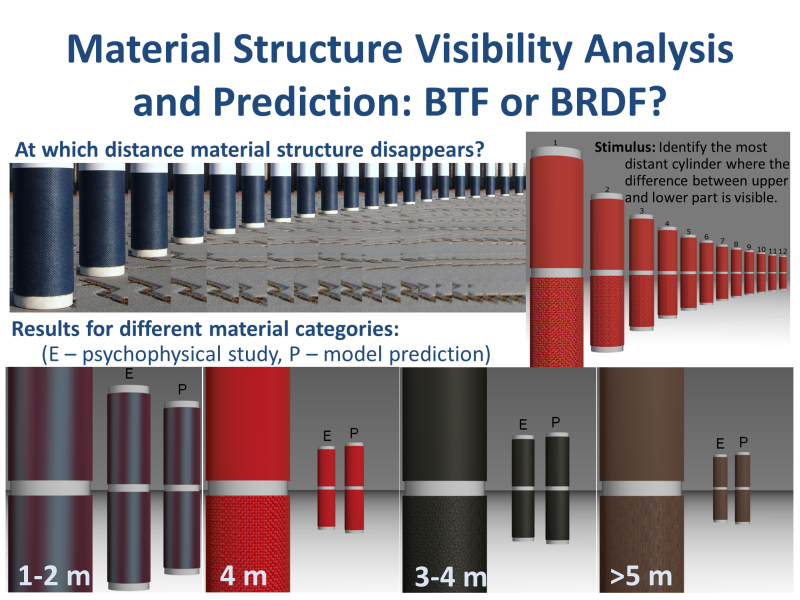 However, the shift from BRDF to BTF represents not only a huge leap in respect to the realism of material reproduction, but also related high memory and computational costs stemming from the storage and processing of massive BTF data. In this work we argue that each opaque material, regardless of its surface structure, can be safely substituted by a BRDF without the introduction of a significant perceptual error when viewed from an appropriate distance. Therefore, we ran a set of psychophysical studies over 25 materials to determine so called critical viewing distances, i.e., the minimal distances at which the material spatial structure (texture) cannot be visually discerned. Our analysis determined such typical distances typical for several material categories often used in interior design applications. Furthermore, we propose a combination of computational features that can predict such distances without the need for a psychophysical study. We show that our work can significantly reduce rendering costs in applications that process complex virtual scenes. This research has been supported by the Czech Science Foundation grant 14-02652S. We would like to thank all volunteers for taking part in the psychophysical experiments. Finaly, we would like to thank all revievers for time they spent by considering and improving our paper.